Henrietta’s life is filled with powerful emotions, happy memories and strong family bonds. She prides herself on her close knit family and numerous friends in the community. The drastic comparison of her mother being ‘left with no means of support’ (1.4) to living a ‘very leisurely life’ (3.3) displays her achieved ambitions of providing a secure and stable family life. The memoir is evenly split between her childhood and adulthood and she writes with deep emotion and love for her family, thus enabling her to overcome hardships and focus on her fortunate relationships. 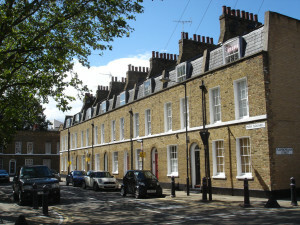 Modern day picture of York Square, Stepney – the housing estate Henrietta grew up on. Henrietta Burkin was born in 1904 in Stepney, London. However, she moved around London several times for her father’s job, her commitment to her husband Harry, and to secure safety during the war. Regardless of the numerous houses and flats she lived in, I admire her efforts to always make a house into a home and create familiarity and comfort for her family. Throughout her memoir she retains vivid detail of each housing establishment and commemorates playing in the streets stating, ‘we children had tremendous fun’ (1.5). She particularly draws attention to her second home in Charing Cross, where her family stayed rent free due to the success of her father’s job. In fact, her memoir suggests there could be a sequel as she states that this part of her life was very exciting and ‘which I might write about one day’ (1.24). She admires the access to beautiful parks, visiting the National Gallery and welcomes the frequent visitors (2.5). 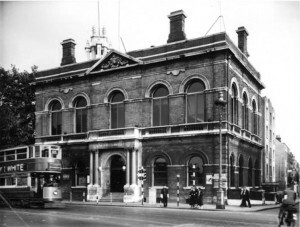 It is evident that she relished living in central London prior to the First World War. The most striking aspect of the memoir is the relationship between family members. Henrietta worships her mother and, alike, her step-father idolises Henrietta. She focuses upon the more prosperous and enjoyable moments of her life, unlike other autobiographers who show the hardships and realities of working class. Her parents used every last penny to ensure she indulged in life and visited many areas of the countryside during summer. However, as well as joyous memories, she also acknowledges deep sadness in her life when her mother dies of cancer, further emphasising their inseparable bond. She states, ‘then commenced the loneliest time of my life’ (2.16), which turned into a year of unhappiness. Shortly after the death of her mother, Henrietta became engaged to Harry (a friend of the family) and she does not hold back with pouring out her emotions for him. She states, ‘he was so dependable, and capable of doing anything’ (3.14) and embraces the sentimental moments they share when he is not at war. Their daughter, Elaine, unites their family and Henrietta draws particular attention to her through the creation of her own poem. The poem titled, Elaine, begins with grand expectations for her as she describes her opportunities as an ‘open door to ambition’ (3.20) and hopes for the future that, ‘she’ll still remain gentle, fair, thoughtful and kind’ (3.20). As a family they celebrate Elaine’s educational success, engagement and marriage and the birth of her children. Henrietta and Harry welcome both grandchildren with open arms into their family and into their home. When I was expecting my child, I hoped for a son. Wishing her gentle, kindly, stately and fair. Elizabeth, Diana, Margaret or Claire? The fair lily-maid of Astolat, the gentle Elaine. Friends, comfort, fine clothes and worldly things. She’ll still remain gentle, fair, thoughtful and kind. Although signs of class are not evident through family relationships in the memoir, characteristics of the working class are displayed through home life and housework. Prior to marriage, Henrietta pursued the job as a secretary for eleven years and she states that she found the job ‘interesting’ (2.6). However, Harry was the bread winner. Women who worked were often portrayed as neglecting homes that ‘lacked domestic or material comfort’ (Bourke, 65, 1994). David Vincent comments that, ‘the wife was in charge of the household budget as well as emotional support’ (Vincent, 239, 1980). Henrietta provides support for Harry and her father and acknowledges her excitement of visiting Sainsbury’s when the wages arrived home (1.10). There is very little mention of Henrietta’s housework, but it is evident to readers that she completed it due to the absence of Harry in the war. She remains modest and describes in detail the events of the war in order to educate her readers about a world event rather than her menial, everyday tasks. Henrietta portrays absolute compassion and love for her family and her memoir is filled with happy memories that are central to her life. Mary Hollinrake (b.1912) is another female, working class author who displays deep love for her family and is written by another student, Holly Shea. I can see a strong connection between both authors when Hollinrake states that, ‘life was very much a family one’ (35). Both Burkin and Hollinrake display difficulties in working class life, however I argue that family was a key aspect to their happiness. I would conclude that Burkin’s life is not ridden with the difficulties facing many working-class people but it is evident that she wants to portray her life in the happiest light she can. She ends her memoir by stating, ‘we were extremely happy’ (5.3) and I am enticed by her optimism of life whilst she acknowledges her working class status. Bourke, Joanna. Working-Class Cultures in Britain 1890-1960. Routledge: London. 1994. Burkin, Henrietta, ‘Memoirs of Henrietta Burkin’, TS, pp.86 (c.50,000 words). Brunel University Library. 2:118. Extract published in J. Burnett (ed. ), Destiny Obscure: Autobiographies of childhood, education and family from the 1820s to the 1920s (Allen Lane, London, 1982), pp.306-312. Brunel University Library and Ruskin College Library, Oxford. Hollinrake, Mary. ‘Lancashire Lass’. Burnett Archive of Working Class Autobiography, University of Brunel Library, Special Collection, 2:413.